Overwhelmed by all the amazing National Poetry Month content coming out every day? Need a refresher? 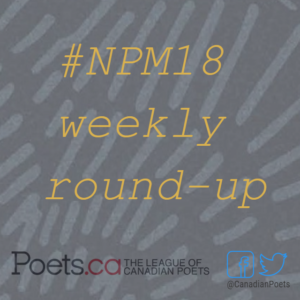 We’ll be rounding up our blog content, along with the awesome stuff our friends at Open Book, All Lit Up, 49th Shelf, and CBC Books are releasing – plus other NPM news that catches our eye each week; all month long. This week we’re also highlighting blogs run by League members who are posting about National Poetry Month or sharing poetry for the occasion! Get a glimpse of NPM from a poet’s eye! Contest! Enter to Win an Incredible Poetry Month Prize Pack from Wolsak & Wynn! Last year we raised our poetic fists for National Poetry Month with Poets Resist, a month-long celebration of poetry as a form of resistance. This year, we’re taking a deep breath and preserving our collective strength with Poetry Cure, a series dedicated to poetry as a mode of healing. Every day on All Lit Up, we’ll chat with a different poet and share a poem that we hope will be a little breath of fresh air as you move through your day. Plus, sign up for our Daily Poetry Cure newsletter and get a poem delivered to your inbox every day for the whole month. So go ahead and check out our cool, fresh line-up of poets coming your way starting on April 2.